Along with their announcement of the new OM-D EM-1 Mark II, Olympus announced a number of new accessories for their flagship cameras. The biggest announcement was the trio of lenses that will be available for the Mark II. All three are branded under the Olympus M.Zuiko line. They include the M.Zuiko Digital ED 12-100mm f4.0 IS PRO, the M.Zuiko Digital ED 25mm f1.2 PRO and the M.Zuiko Digital ED 30mm f3.5 Macro. 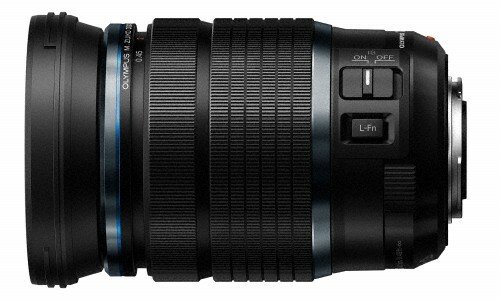 The 12-100mm will be out in November at a list price of $1300. The 25mm and the 30mm drop earlier in October for $1200 and $300, respectively. Finally, Olympus also announced a new on-camera flash for the Mark II, the FL-900R. The 900R is designed to be used outdoors and features a dust-proof, splash-proof and freeze-proof housing. Like the 25mm and 30mm lenses, the FL-900R will be out in October with a list price of $580. For more details and technical specifications check out the press releases below. We’ve also included images of each of the products. In order, you’ll see the 12-100mm, the 25mm, the 30mm Macro, and the Flash. CENTER VALLEY, Pa., September 19, 2016 — Olympus once again challenges conventional lens design with the new Olympus M.ZUIKO Digital ED 12-100mm f4.0 IS PRO (24–200mm focal length in 35mm equivalent), a compact, lightweight, high-magnification zoom lens that maintains a constant aperture of f4.0 from wide angle to telephoto. The latest addition to the M.ZUIKO PRO series incorporates powerful image stabilization (IS) and covers a focal length range that typically would require two zoom lenses to deliver unrivaled mobility for professionals looking to capture outstanding images in an expanded array of handheld shooting situations. The Olympus M.ZUIKO Digital ED 12-100mm f4.0 IS PRO combines multiple special lens elements to produce a high magnification factor and excellent resolution packed inside a small body. DSA (Dual Super Aspherical) lenses, HR (high refractive index) lenses, and Super HR (super-high refractive index) lenses are combined to effectively correct aberration and minimize the number of lens elements in the configuration, reducing the overall length of the lens. By using multiple ED lenses, color fringing that tends to appear in telephoto shooting is thoroughly reduced, maintaining high resolution and edge-to-edge sharpness across the entire zoom range. The in-lens image stabilization works in concert with Olympus’ in-body 5-Axis Image Stabilization of compatible OM-D® and PEN® camera bodies to create 5-Axis Sync IS, the world’s most powerful image stabilization with 6.5 shutter speed steps of compensation performance. Camera shake commonly associated with handheld telephotography is eliminated, enabling users to capture sharp images and smooth video without the use of a tripod. In addition to its broad focal range, this high-magnification zoom lens boasts outstanding close-up performance with a minimum working distance of 1.5 cm and a maximum shooting magnification of 0.6x (35mm equivalent) at the 12mm wide-angle setting. The Olympus M.ZUIKO Digital ED 12-100mm f4.0 IS PRO features lightweight, weatherproof construction, providing dustproof, splash proof and freeze proof (down to 14°F/-10°C) performance to meet the needs of professional photographers in any shooting situation. The Olympus M.ZUIKO Digital ED 12-100mm f4.0 IS PRO has been added to the high-performance M.ZUIKO PRO series to meet the needs of professional photographers. Multiple special lens elements provide a high-magnification factor and superior resolution in a compact lens body. The DSA (Dual Super Aspherical) lenses, HR (high refractive index) lenses, and Super HR (super-high refractive index) lenses have been combined to effectively correct chromatic aberration and minimize the number of lens elements in the configuration, reducing the overall length of the lens. The use of glass materials with a higher refractive index than that of previous DSA lenses has resulted in smaller lens diameters. This makes it possible to build a single lens that covers the focal length of two typical professional zoom lenses. By using multiple ED lenses, the color fringing that tends to occur in telephoto shooting is thoroughly reduced, maintaining high resolution and edge-to-edge sharpness across the entire zoom range. Olympus Z Coating Nano lens coating technology provides sharp, clear image quality by virtually eliminating flare in backlit situations and maintaining resolution when strong light sources are present in the frame. The Olympus M.ZUIKO 12-100mm f4.0 IS PRO is equipped with a built-in image stabilization system for blur-free shooting across the entire high-magnification zoom range. By pairing the lens with a compatible Olympus OM-D or PEN camera, the lens stabilization works in sync with the camera’s in-body stabilization to create 5-Axis Sync IS, the world’s most powerful stabilization system providing up to 6.5 shutter speed steps of compensation performance. Because the in-lens image stabilization alone provides up to five shutter speed steps of compensation performance, the lens can even be used with other camera bodies unequipped with image stabilization. The close focusing distance of 15 cm at the 12mm wide-angle setting makes it possible to take close-up shots up to 1.5 cm away from the end of the lens, while the maximum shooting magnification of 0.6x (35mm equivalent) opens up new possibilities of expression. The lens design features superb close-up shooting performance even at other focal lengths, with a minimum working distance of 27 cm and a maximum shooting magnification of 0.42x (35mm equivalent) at the 100mm telephoto setting. The lens features dust-proof and splash-proof construction, with hermetic sealing in 12 locations. When combined with dust-proof, splash-proof and freeze-proof bodies available in the Olympus OM-D series, users can take advantage of all types of shooting environments. This lens boasts the same high-quality metal exterior design as the other lenses in the M.ZUIKO PRO series. It is equipped with the Manual Focus Clutch mechanism, which makes switching to manual focus possible by pulling the focusing ring toward you. The lens barrel features the Image Stabilization activation switch and the L-Fn button to pause autofocus or assign other custom settings. The LC-72C is for lenses with a filter diameter of 72mm and can be attached and removed even with the lens hood attached. The LH-76B is specifically designed for the Olympus M.ZUIKO Digital ED 12-100mm F4.0 IS PRO. It reduces unwanted light entering the lens in backlit scenes while also protecting the lens. The hood lock button has been improved to prevent unintentional removal. The LSC-0914 is a three-layer construction purse-string-type lens case which securely protects the lens. The lens can be stored in the case with the lens cap, protection filter and lens hood attached to the lens. This protection filter incorporates ZERO Coating to reduce reflections and flare, black-edged glass, and a satin, glare-reducing black alumite aluminum frame. The filter can also be used on other lenses with a filter diameter of 72mm. (*As of September 2016. CIPA guideline compliant, when correction is carried out on two axes (yaw and pitch). When halfway release image stabilization is off. Focal length f=100mm. As of September 2016, per CIPA testing guidelines, using Olympus OM-D E-M1 Mark II Body and 12-100mm f4.0 IS PRO, when correction is carried out on two axes (yaw and pitch) at focal length 100mm (35mm equivalent focal length: 200mm). CENTER VALLEY, PA., September 19, 2016 — Olympus expands its award-winning M.ZUIKO PRO lens lineup with the breakthrough M.ZUIKO Digital ED 25mm f1.2 PRO (50mm focal length in 35mm equivalent). This Micro Four Thirds® system lens boasts a superior optical design with 19 lens elements in 14 groups that thoroughly prevents aberration, distortion and fringing to achieve superb resolution and beautiful defocusing effects from its widest aperture setting of f1.2. The M.ZUIKO Digital ED 25mm f1.2 PRO features a lightweight internal focusing mechanism that uses a single thin lens element for extremely fast and accurate focus point acquisition. The advanced MSC (Movie and Still Compatible) autofocus mechanism provides virtually silent and smooth focusing and aperture performance, ideal for video capture. When combined with the powerful in-body 5-Axis Sync Image Stabilization of the Olympus OM-D® and PEN® cameras, the M.ZUIKO Digital ED 25mm f1.2 PRO provides outstanding resolution and blur-free images under almost all lighting conditions. The advanced optical design provides a single focusing lens element for fast and accurate focus point capture. The MSC mechanism enables high-speed, high-precision still image autofocusing and virtually silent, smooth autofocusing for video. Even in shooting situations with a shallow depth of field, quick, accurate focusing allows for beautiful defocusing effects by accurately focusing on faces and eyes when users select Face Detect AF or Eye Detect AF on Olympus OM-D and PEN camera bodies. When combined with compatible OM-D and PEN cameras’ Silent Mode, users are able to photograph musical performances and piano recitals without making a sound. This lens features dustproof and splashproof construction, with hermetic sealing in 11 locations. When combined with dustproof, splashproof, freezeproof bodies available in the Olympus OM-D series, users can take advantage of all types of shooting environments. Lens cap for lenses with a filter diameter of 62mm. In addition to the ability to remove the lens even when the lens hood is still attached, the lens cap design has been improved for easy removal. Lens hood specifically designed for M.ZUIKO Digital ED 25mm f1.2 PRO. It reduces unwanted light entering the lens in backlit scenes and also protects the lens. The hood lock button has been improved to prevent unintentional removal. A three-layer construction purse-string-type lens case securely protects the lens. The lens can be stored in the case with the lens cap, protection filter and lens hood attached to the lens. This is a protection filter for making full use of M.ZUIKO PRO lenses. ZERO Coating, which halves reflections compared to the traditional multicoating, uses black-edged glass and a satin, glare-reducing black alumite aluminum frame. It can also be used on other lenses with a filter diameter of 62mm. ENTER VALLEY, Pa., September 19, 2016 – The new M.Zuiko Digital ED 30mm f3.5 Macro (35mm equivalent: 60mm) Premium lens is designed for exceptional optical performance and image quality in a lightweight compact form. This macro lens is the latest addition to the award-winning M.Zuiko family of Micro Four Thirds lenses that deliver crystal-clear image quality and exquisite bokeh for entry-level and advanced users looking to produce flawless, professional-quality images and videos of everyday subjects. With the highest image magnification of 1.25x (35mm equivalent: 2.5x) in its class1and a minimum focusing distance of 95mm (14mm from the end of the lens), this macro lens is an affordable way to enter the world of high-quality macro photography. The minimum shooting field of 13.9 x 10.4mm allows users to magnify and capture minute details like never before. CENTER VALLEY, Pa., September 19, 2016 — Olympus responds to the needs of advanced photographers with the new flagship FL-900R Electronic Flash, a high-intensity flash with a maximum guide number of 58 and 10 fps sequential shooting tracking speed when paired with the new OM-D® E-M1 Mark II camera body, the fastest in its class. The compact, lightweight Micro Four Thirds® system-compliant flash is dust-proof, splash-proof and freeze-proof (-10°C)3 and pairs with the weatherproof E-M1 Mark II, E-M1, E-M5 Mark II cameras and M.ZUIKO® PRO lenses to give users peace of mind when shooting in a wide variety of extreme conditions. The FL-900R Electronic Flash produces optimal lighting even in challenging environments when combined with the camera’s built-in TruePic image processor and TTL metering. Photographers are able to cover an angle of view for a focal length range of 12–100mm (24–200mm in 35mm equivalent) and 7mm–10mm (14–20mm in 35mm equivalent) when using the built-in wide panel. Charging time has been reduced to approximately 2.5 seconds, which provides fast sequential shooting and tracking performance that enables split-second capture of fast-moving subjects. When paired with the Olympus OM-D E-M1 Mark II, the FL-900R is compatible with various Olympus shooting modes, including Wireless RC mode High-Res Shot, Focus Stacking, Focus Bracketing, Movie Mode (with LED light) and Multi-Flash Mode, for a wide range of photographic expression. The Olympus FL-900R Electronic Flash, a high-intensity flash with a maximum guide number of 58m, makes use of an Olympus camera’s TruePic image processor and TTL metering to provide optimal lighting in a wide variety of shooting conditions. When using the built-in wide panel, the flash covers an angle of view for a focal length range of 12–100mm (24mm–200mm in 35mm equivalent) and 7–10mm (14–20mm in 35mm equivalent). Charging circuits have been optimized for nickel metal hydride (Ni–MH) rechargeable batteries to reduce the recycle time to approximately 2.5 seconds, enabling 10 fps sequential shooting and tracking performance to capture split-second motion and fast-moving subjects.